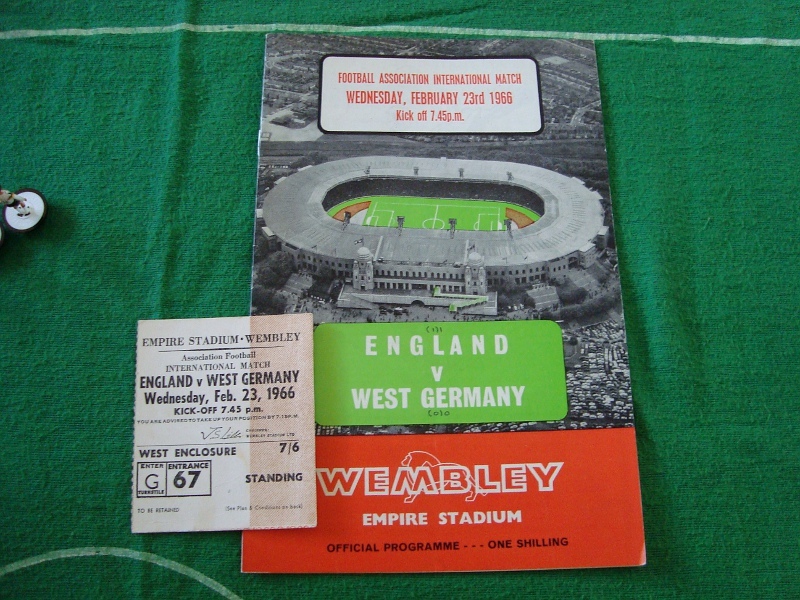 The official match programme for the 1966 friendly at Wembley contains fourteen black and white pages, and had a price of one shilling. Just over A5 in size, the cover features an image of the Empire Stadium with its all-encircling roof that was completed in 1963. 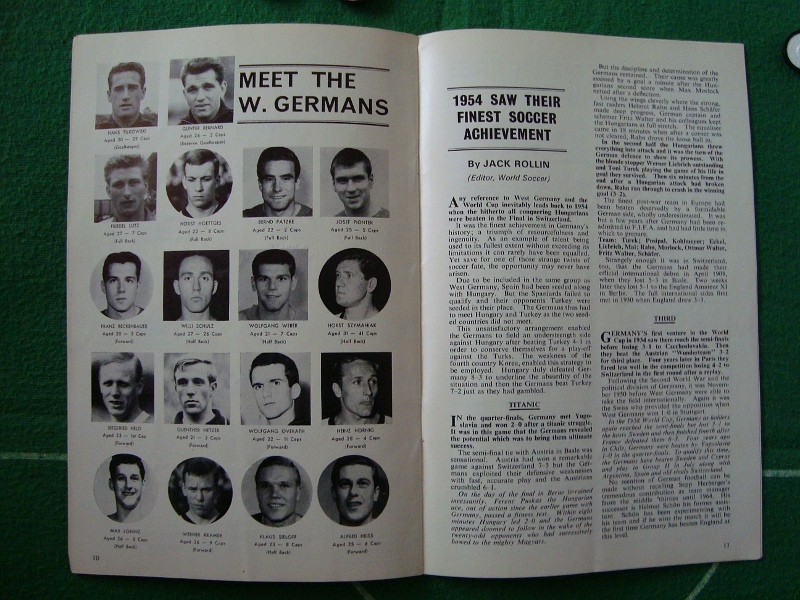 The programme contains an introductory article by the Sunday Mirror’s Sam Leitch, the full squad lineups and the usual facts, stats and features, and a short piece on Germany’s World Cup victory in 1954. There is also the complete opening round fixture list for the upcoming tournament being held in England. With the World Cup Finals less than five months away, Germany and England met again at Wembley on what was a rainy February evening. 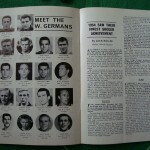 While Alf Ramsey’s squad was finally starting to take shape – nine of the players that lined up for the February fixture (ten including substitute Ray Wilson) would contest the World Cup in July – Helmut Schön was still in the process of finalising his starting eleven. In contrast to the opposition, only five of the German players would take the field five months later when the two teams returned to the Twin Towers. 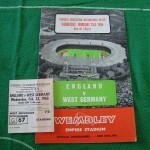 While the game would be of no great consequence in itself, England were clearly intent on protecting their unbeaten record against Germany – while the Germans were equally determined to rid themselves of the burden of never having beaten England in almost sixty years of both amateur and professional competition. Given the weather, the heavy conditions underfoot and the context of the match it was never going to be a classic: after a fairly equal opening forty minutes where both Hans Tilkowski and Gordon Banks were mildly tested, it was a fumble by the German ‘keeper that gifted England the lead. A speculative cross into the box from George Cohen was met by Roger Hunt, whose header squirmed out of Tilkowski’s hands. With the ball coming to rest some six inches from the goal line and the floored Tilkowski looking on helplessly, Nobby Stiles pounced and slammed the ball into the gaping net. The early part of the second half saw much of the same, with England marginally on top. 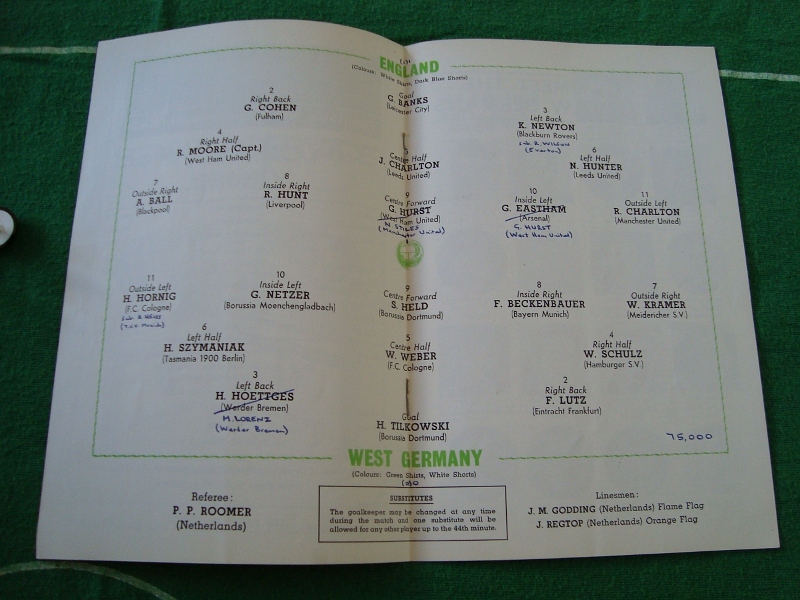 Sensing Tilkowski’s weakness against the high ball, England took every opportunity to pepper the German box with crosses – but to no avail as the German keeper met every one with a firm punch. 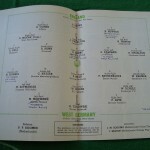 As the match entered its final quarter, the Mannschaft started come back into it, with youngsters Franz Beckenbauer and Günter Netzer combining effectively through the centre. The pressure from the men in green was beginning to swing the momentum their way, and with fifteen minutes left on the clock a neat three-man move found Hamburger SV winger Werner Krämer on the edge of the box. Krämer found room to hit a right-foot shot, but the ball crashed off an England defender and headed towards the byline. The energetic Siggi Held chased it down, and with his left foot swept the ball back into the box, where it was crisply met on the volley by subsitute Alfred “Fredy” Heiß. As the Germans ran towards the centre circle huddled in celebration, Dutch referee Pieter Roomer ran towards his linesman – who determined that the ball had crossed the byline before Held had got his cross in. The goal was disallowed and a corner awarded. The Germans took the decision well, and continued to press forward – probably spurred on by the fact that the home crowd, disenchanted by their own team’s performance, had voiced their displeasure at the official’s decision to disallow what had been a deserved equaliser. A beautiful through-ball from inside his own half by Beckenbauer – wearing the number 8 shirt – then found the speedy Krämer in space on the right. After deftly skipping past his marker the Duisburg man appeared to have done the hard work, but his weak shot was scuffed into the arms of Banks. Tilkowski made a fine point-blank save and a Roger Hunt lob hit the crossbar, but in the end it was Stiles’ grubby first-half effort that proved to be the difference between the two sides. It was clear that Germany had played the better football – confirmed by the crowd’s reaction – but the fact remained that England had somehow managed to conjure up yet another win to extend their unbeaten record by one more game. Away: played 4, won 0, drawn 0, lost 4. Goals for 1, goals against 16. Overall: played 11, won 0, drawn 2, lost 9. Goals for 11, goals against 39.